An ethanol vapor sensor is fabricated using a ZnO nanoparticle film as a coating on a silicon-on-insulator (SOI) microring resonator of 5µm in radius. The sensor can detect ethanol vapor concentrations as low as 100ppm. This achievement successfully demonstrates the potential of SOI technology for the development of sensitive, compact, low-power and inexpensive optical gas sensing devices. INTEC, imec’s associated laboratory at Ghent University, and imec have coated SOI microring resonators with films of 3.5nm ZnO nanocrystals for optical sensing of gaseous ethanol. Ethanol vapor concentrations down to 100ppm have been detected. The proposed technology meets today’s demand for compact, cheap, low-power and reasonably sensitive gas detection systems. By doping metal oxides with specific functional molecules, this technique can be extended for selective detection of other gases. With this result, INTEC and imec have demonstrated the potential of SOI technology for integrated low-power and low-cost optical gas sensing. With future advancements in micropatterning techniques, other selective films can efficiently be coated on several microring resonators to achieve integrated and multiplexed multi-gas sensing on an optical chip. In several industrial, medical and environmental applications, this technology can be advantageous over other techniques (electrochemical, catalytic...). For instance, integrated optical gas sensors are very compact and can operate at room temperature, they are suitable for remote sensing and multiplexing, they are not affected by electromagnetic interference and don’t involve direct electrical contacts enabling risk free operation in explosive gas environments. Moreover, these sensors can provide a robust and reliable solution taking the advantage of stable metal oxide coatings. The compatibility of the SOI devices with CMOS fabrication tools and the promise of inexpensive mass fabrication make this technology additionally attractive. The microring resonators have been fabricated with standard CMOS fabrication facilities. In practice, 193nm deep-ultraviolet photolithography in combination with dry etching is used to fabricate high-Q microring resonators of 5µm in radius. 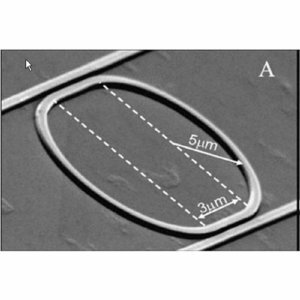 The local coating on the ring resonators is prepared from colloidal suspensions of ZnO nanoparticles of 3.5nm diameter. After coating, the SOI microring resonators have Q values of about 15,000. The porous nature of the coating provides a large surface area for gas adsorption. When ethanol vapor is adsorbed, a change in the ZnO refractive index occurs and a shift in the resonance wavelength of the microring resonator due to evanescent field interaction can be measured. E.g., exposure to 1500ppm of ethanol leads to a shift of 500pm. With this sensing configuration, ethanol vapor concentrations down to 100ppm are detected and a detection limit below 25ppm is estimated.